If you or someone you love has been involved in a car accident that was caused by a driver who was texting, you may have legal recourse. Contact a Georgia auto accident attorney who is experienced in handling these types of claims because you may be entitled to receive compensation for your injuries. A Pew Research poll conducted in 2011 found that 73 percent of adults in the U.S. send and receive text messages. In one month, more than 196 million text messages were sent throughout the country. However, some of these messages are sent and received while people are driving, and although texting and driving is illegal in Georgia and many other states, some drivers fail to obey the rules and continue to use their cellular devices while behind the wheel. Although it is dangerous to talk or use any handheld device while operating a motor vehicle, texting is often considered to be the most risky behavior of them all. Whereas a driver talking on a cell phone most likely has his or her eyes on the road, when reading or composing a text message, he or she must take his attention off the road. According to the National Highway Transportation Safety Administration, a driver takes an average of 4.6 seconds to read a text message. While this may not seem like a long time, consider that he or she can travel the length of a football field at 55 miles per hour in 4.6 seconds. When a driver reads a message, the eyes and brain are focused on the phone, not on operating the vehicle or surveying potential obstacles and hazards. The risk of an accident while texting and driving is so great that the NHTSA reports a 23-fold risk of an auto accident if the driver is sending or reading messages on a phone. Conversely, a driver is only four times more likely to cause a car crash if he or she is simply using a handheld device. If a driver makes a conscious decision to send or receive a text message while he or she is behind the wheel, he is not only endangering himself but his passengers, pedestrians, motorcyclists, bystanders, and other drivers as well. 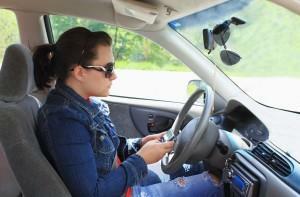 The state of Georgia has a law in place that prohibits texting while driving. Texting is often easier to prove than other types of distractions such as eating, listening to the radio, or disciplining children in the backseat. However, it is important to seek legal counsel from an experienced Georgia car accident attorney who can help you prove your case because you will need to provide evidence that texting was the direct cause of the accident. A lawyer can interview witnesses, re-create the scene of the crash, and speak to insurance providers and physicians on your behalf to help you to obtain the compensation to which you may be entitled. Depending on the circumstances surrounding your injuries and the accident itself, you may be eligible to recover damages for emotional distress, pain and suffering, lost wages, and medical expenses. At Van Sant Law, we take distracted driving accidents very seriously. If you or a loved one is the victim of an accident caused by distracted driving, we ask that you contact us immediately. We have the experience and knowledge to help you build a case and receive compensation for your injuries.